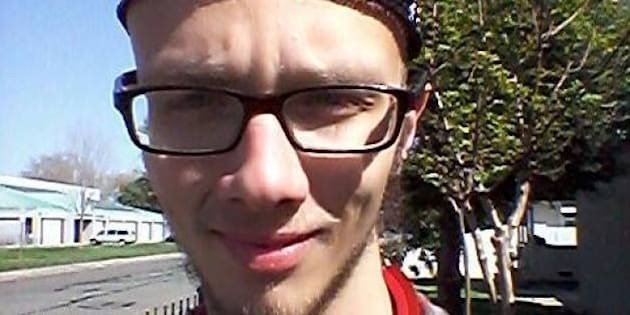 SEATTLE - A California man who spoke of wanting to bomb the Los Angeles subway system was arrested near the Canadian border in Washington state and charged with attempting to travel to Syria to fight alongside Islamic extremists, federal prosecutors said Monday. Nicholas Teausant, 20, of Acampo, California, an unincorporated area near Lodi, was taken off a northbound Amtrak bus overnight just short of the border. A criminal complaint filed in federal court in Sacramento described him as a student at San Joaquin Delta Community College in Stockton and a member of the National Guard who is being discharged for failing to meet basic academic requirements. Beginning last spring, Teausant began expressing on his online photography account a desire to see America's downfall, saying ``I would love to join Allah's army but I don't even know how to start,'' the complaint said. Later, he took to another online forum to say he hoped to fight in Syria, the document states. It wasn't immediately clear if Teausant had a lawyer in California. He was charged with a single count of attempting to provide material support to a foreign terrorist organization and agreed during a hearing at U.S. District Court in Seattle to be returned to Sacramento to face the charge. Tall and lanky with closely shorn hair and a thin beard, Teausant appeared in court wearing a white T-shirt and tan pants. He sat hunched beside a lawyer appointed for that hearing only, answering ``Yes, ma'am'' or ``No, ma'am,'' to questions posed by Magistrate Judge Mary Alice Theiler. The complaint said he had discussed numerous other ideas for terrorist activity that never came to fruition, including a plot supposedly hatched during a camping trip with seven other people to bomb the Los Angeles subway system last New Year's Eve or New Year's Day. Investigators never corroborated that such a camping trip actually occurred. When an informant questioned Teausant on Jan. 4 about what happened to his plan, Teausant responded that it was cancelled because ``they'' had been ``tipped off,'' the complaint said. The complaint said he had been planning since October to support the efforts of the Islamic State of Iraq and the Levant, a group that has been fighting in Syria's three-year-old civil war and is designated by the U.S. State Department as a terrorist organization. Investigators said Teausant discussed his scheme at length with a person who turned out to be a paid FBI informant, repeatedly affirming that he was serious about it. The Islamic State of Iraq and the Levant is a breakaway organization from al-Qaida that is considered one of the most brutal groups fighting in Syria's civil war, made up largely of non-Syrian Islamic militants. It has seized several areas in Syria as it fights the government of President Bashar Assad. Among Teausant's plans was to appear in videos for the group, without covering his face _ to be ``the one white devil that leaves their face wide open to the camera,'' he was quoted in the complaint as saying. The informant put Teausant in contact with a ``mentor'' _ in reality, an undercover federal agent _ who could purportedly approve his efforts to join the extremists. Early this month, the ``mentor'' blessed Teausant's travels, and he boarded a train for Seattle on Sunday night, the complaint said. When the bus arrived in Blaine, just south of Vancouver, British Columbia, U.S. Customs and Border Protection stopped it and questioned Teausant about where he was headed. He responded that he was travelling to Vancouver and was arrested, the complaint said. The complaint said Teausant enlisted in the National Guard in April 2012 but never underwent basic training because he didn't meet academic requirements. The maximum penalty for attempting to provide support to a foreign terrorist organization is 15 years in prison and a $250,000 fine.